Last weekend, hubby bought me a piece of soft, buttery, killer-yummy bread from the Bread Shop and told me it was one of their latest featured bread, which he has tried in the past in France. Seems it originates from one of the places I love -- Brittany. A place where they worship and adore butter -- and it showed in the Kouign-Amann bread he bought me. Yes, the name is a bit hard to pronounce and spell, but it was worth every darn calorie. I kept thinking about that bread so today I could not help myself but drive to The Bread Shop after little one's ballerina classes. 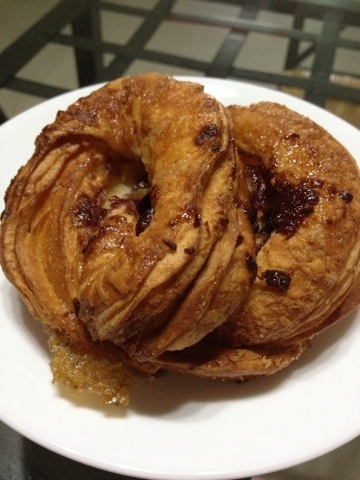 One thing I learned though: not a good idea to buy that Kouign-Amann late in the afternoon. It tasted FAR OFF from what I ate last weekend. Sigh, spoiled my excitement! Apart from that, there are other bread worth mentioning. My daughter super enjoyed their Sugar Butter bread. I love it, too. If only I could spare more calories I think I would eat that every other day. 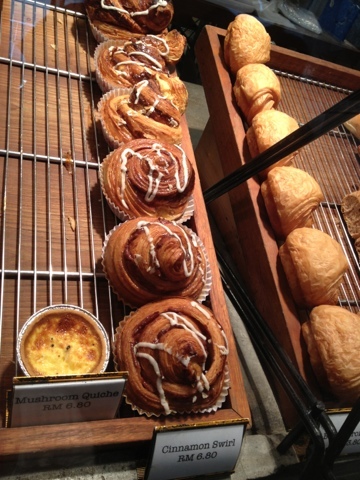 Another lovely pastry is the Cinnamon Swirl, especially for those cinnamon roll lovers. You will not be disappointed by the sweetness & cinnamon-ness balance with this pastry created by the bread shop. This is one of the old time favorites, when we first discovered The Bread Shop years ago. 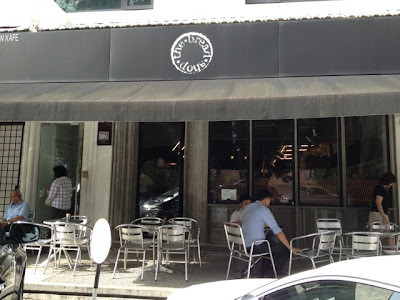 The Bread Shop is quietly tucked inside the Damansara Heights neighborhood. And despite not being located in a mall, it was packed with people inside -- enjoying drinks and bread, when we dropped by. I shall perhaps revisit to try a really good tasting, newly-baked Kouign-Amann one of these days. 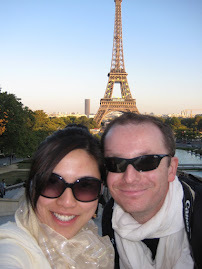 For those who love their croissants and everything butter, you should try it, too! 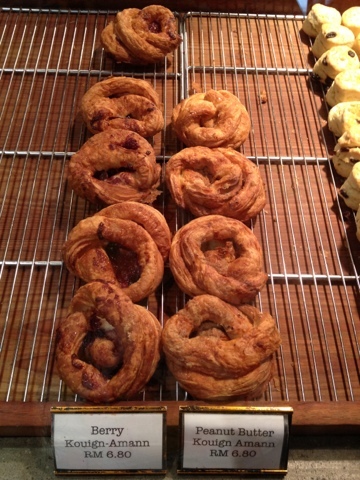 Berry Kouign-Amann: not worth buying this at 5pm in the afternoon. of soft and buttery. A lesson learned. 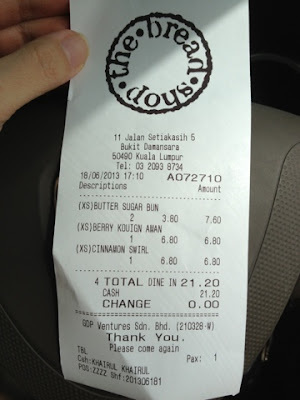 Total bill for 4 pieces of bread from the Bread Shop. This is take-away price. 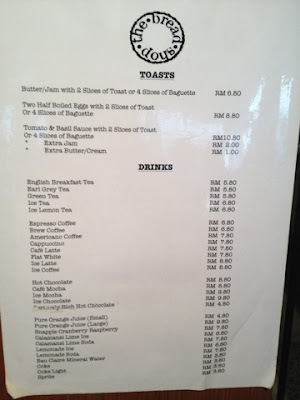 I believe that if you dine-in there is additional tax. 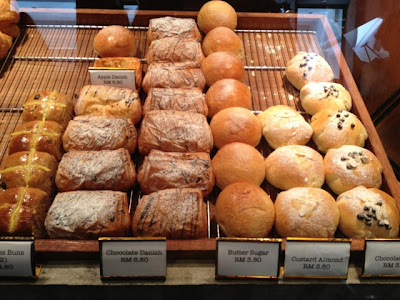 The butter sugar bread... we love it. My daughter loves it. Killer butter inside. The Cinnamon Swirl is one of my old time favorites from this shop. I remember loving it the first time I tried it years ago when we discovered this place. the love of butter. They ran out of the "original" flavor which is sans berry or peanut butter.